President Vladimir Putin participated in a memorial event for international Holocaust Remembrance Day, the day that Auschwitz was liberated by the Soviet army 70 years ago. The event took place at the world’s largest Jewish Museum at the Marina Roscha Synagogue in Moscow, directed by Chief Rabbi of Russia, Rabbi Berel Lazar. Rabbi Lazar opened the event with the reciting of “kel malei rachamim” prayer, in memory of the 6 million Jews who were murdered in the Holocaust, and the 1.1 million murdered at Auschwitz. “We must thank G-d for all the miracles He performed for those that were saved from the Holocaust,” Rabbi Lazar said in his remarks. Lazar spoke about his own parents’ miraculous survival from the war, and their subsequent building of a Jewish home with descendants who proudly continue the Jewish tradition in many countries around the globe. President Putin mentioned in his speech the many brave Jewish soldiers who fought on the front lines in the Red Army, some of whom were there at the liberation of Auschwitz. “It’s true the Red Army liberated Auschwitz,” Putin said, “but there were about half a million Jews fighting in the army together with the Russians, 250,000 of whom died. “The Jews who were murdered in Auschwitz were innocent, they were murdered only because they were Jews,” Putin continued. “The phenomenon of anti-Semitism unfortunately still exists today,” he said. Holocaust survivor Mrs. Breindel Fleishman, a resident of Israel, traveled to Moscow to participate in the event. Mrs. Fleishman, who was liberated from Auschwitz, now has children who serve as Rabbis throughout Russia. 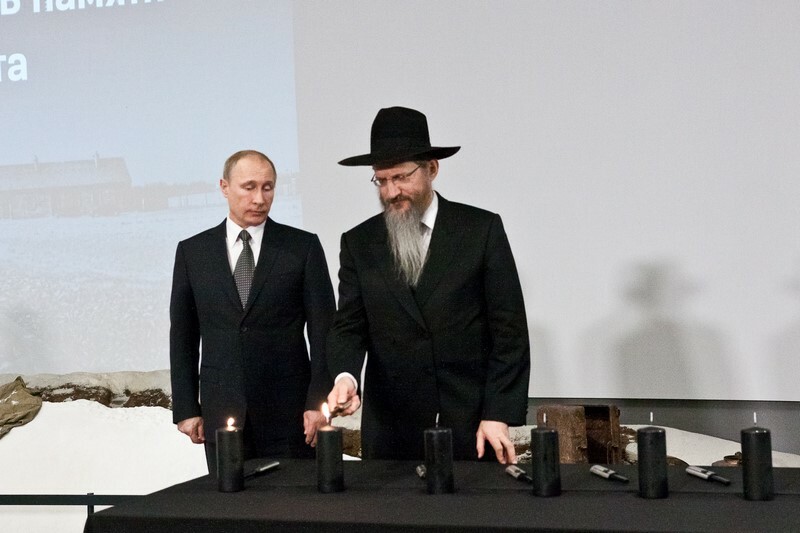 Memorial candles were lit by President Putin, Rabbi Lazar, Mrs. Fleishman, a Russian soldier who was there at the liberation,Alexander Boroda – President of the Federation of Jewish Communities of Russia and a great-grandchild of Mrs. Fleishman, to remember the 6 million Jews who perished. Among the participants were dignitaries, ambassadors from various countries, philanthropist Lev Leviev, Michoel Miralashvilli and friends of the local Jewish community.